Placenta Kodi Addon: What is Placenta? Is it safe and legal to use? If you’ve been looking for free streams of TV shows and movies, you may have heard about the Placenta Kodi addon. Supporters of Placenta argue that it provides a huge variety of content for free. But you may wonder if all of this content is legal or if Placenta is safe to install on your device. In this article, we’ll explore what the Placenta Kodi addon is and what risks you may be taking by installing it. We’ll also suggest some alternative addons you can use if you don’t want to take these risks. Kodi is a piece of software that allows you to play virtually any media on a PC or mobile device. It also works on Android or iOS-based TV devices like the Amazon Fire Stick, Apple TV, and Nvidia Shield. Kodi runs apps called “addons” that allow you to stream video from the Internet. This feature has made it popular with “cord-cutters” who seek to escape the high cost of cable or satellite services by using Kodi to get free content online. Whenever you use Kodi to stream videos over the Internet, you should always use a VPN to protect your privacy and security. If you don’t use a VPN, streaming sites will know where you are located, and they may try to block you from viewing content based on that location. For example, US network channels often block viewers located outside the US from viewing their content while UK channels often block viewers from outside the UK. Using a VPN usually prevents this from happening because it does not allow streaming video sites to know your location. Using a VPN will also help to protect you against man-in-the-middle attacks by hackers and buffering caused by ISP speed throttling. Not all VPNs are good for Kodi users. Most don’t have apps for popular TV devices like the Amazon Fire Stick, making them difficult for Kodi users to install. All VPNs will slow your speed a little, but many are so slow that they buffer constantly when attempting to stream high-def video. Some will keep logs of your activity, creating a new privacy risk. For these reasons, we recommend IPVanish for Kodi users. It has a native app for Amazon Fire Stick and Nvidia Shield, was fast enough to stream 1080p video with no buffering in our tests, and has a strict policy against keeping logs. It’s an excellent way for Kodi users to protect their privacy and security. What is the Placenta Kodi addon? 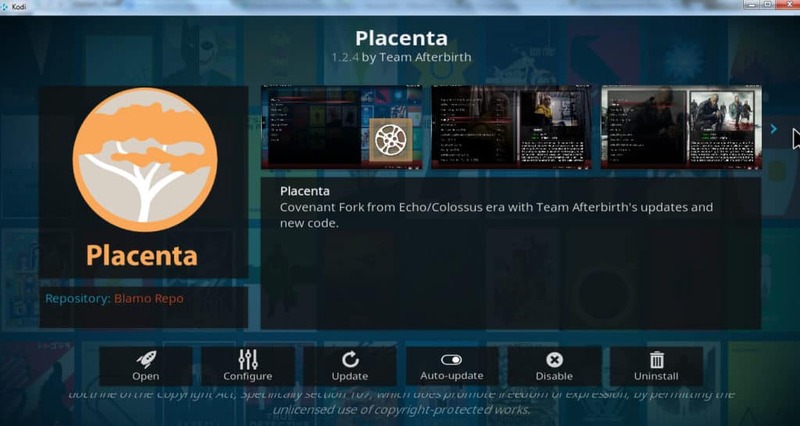 The Placenta Kodi addon is a fork of a popular Kodi addon called Covenant, which is itself a fork of a previous addon called Exodus. Although Placenta does have some new features, such as a more user-friendly menu, it is basically the same Exodus/Covenant addon rebranded. Placenta is popular because it offers links to a wide variety of feature films, including movies that have just left or are still in theaters. It also provides access to the latest episodes of premium shows from channels like HBO and Showtime. In addition, Placenta does not charge any subscription fee for providing this access, which makes many Kodi users happy to use it. Related article: What are Kodi Exodus forks and can you trust them? Despite this popularity, there are a few significant problems with Placenta. First, the streams that Placenta makes available are almost all from unofficial sources. When you watch Game of Thrones on Placenta, for example, you are not connecting to HBO.com or anyone affiliated with HBO. You are streaming from a website that someone has put up on the Internet for the purpose of offering pirated copies of Game of Thrones and other content. So if what you are looking for is legal access to the best TV shows and movies, you aren’t going to find what you’re looking for on Placenta. Second, the current version of Placenta is offered by an anonymous coder who is known only by the pseudonym, Mr. Blamo. This poses a security risk for Kodi users. In the past, some anonymous developers have created Kodi addons that installed malware on users’ computers, including a version of Exodus that could have made users engage in DDoS attacks against the developer’s enemies. There was even one that hijacked users’ devices and forced them to mine bitcoin for the developer. Although Placenta has not been found to carry any such malicious code, it could be added in the future through updates, often without the knowledge of users before the damage is done. Under normal circumstances, consumers are partially protected from malicious software by the threat of lawsuits against developers. But because this developer is anonymous, this protection is not available. This is a risk that Kodi users need to be aware of. Because of these problems, we do not recommend installing or using Placenta Kodi addon. Instead, we recommend the legal, free, and relatively safe Kodi addons listed below. The best Kodi addon to use as an alternative to Placenta is Tubi TV. Unlike Placenta, Tubi TV only connects to the official streams offered at Tubitv.com. There are over 50,000 movies and TV episodes available at Tubi TV, including dramas, comedies, action movies, anime, and popular TV shows like Heroes and WolfBlood. Tubi TV also has $35 million in investments, meaning they’ll be adding even more content in the future. Despite this huge collection of content, Tubi TV is completely free. If you watch using a web browser, you will be interrupted with commercials every few minutes. This is how the site is paid for. But if you use the Kodi addon, all of the commercials are blocked, and you can watch without interruption. Tubi TV is in the Kodi1 repo. 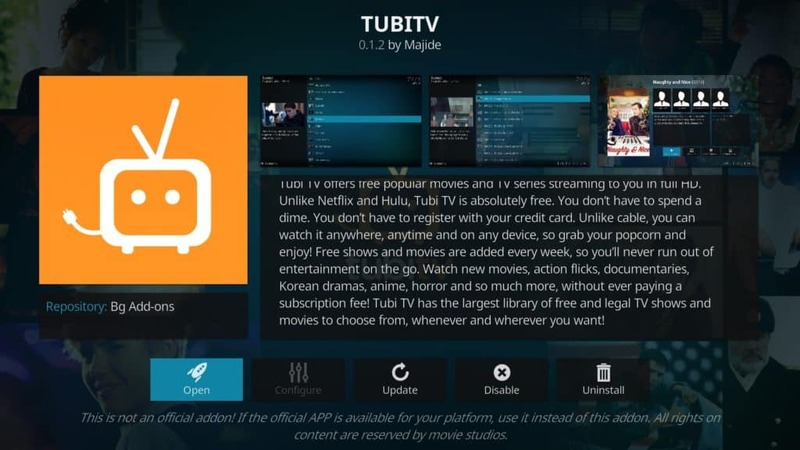 Here is a complete guide to installing and using Tubi TV for Kodi. If you’ve already got Tubi TV and still want to see more, here are some other great alternatives to Placenta. Big Star Movies is in the SuperRepo repository. To install, load Kodi and click addons, then select the “package installer” icon in the upper-left that looks like an open-box. 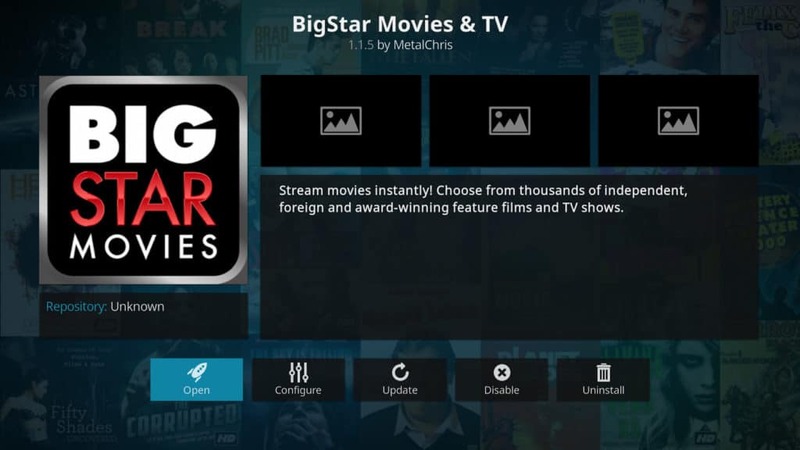 From there, select install from repository → video addons → Big Star Movies and TV → install. If you don’t yet have SuperRepo installed, here are two ways to install SuperRepo for Kodi. Snagfilms is another website that provides free movies and shows. It has African movies, classic movies, Bollywood films, fantasy and horror stories, Korean dramas, war movies, and more. There are no ads on Snagfilms if you watch through the Kodi addon. 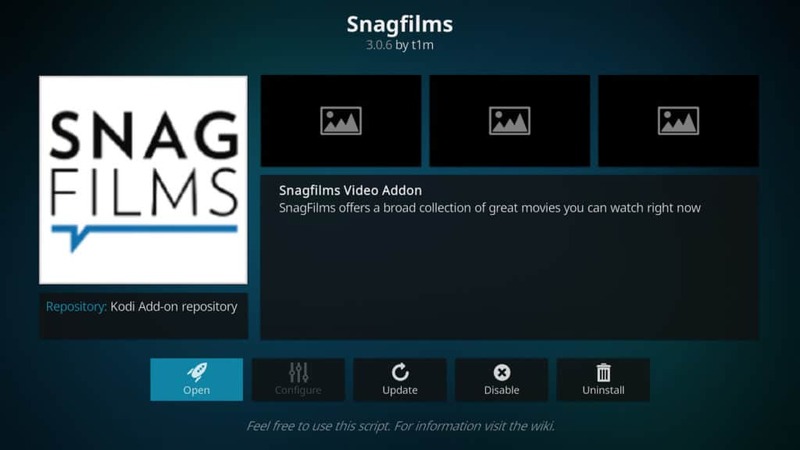 Snagfilms can be found in the official Kodi addon repository. To install, start at the main menu of Kodi. Select addons → download → video addons → snagfilms → install. WNBC Programs connects to NBC.com and streams the latest NBC shows, including Law & Order: SVU, Reverie, SuperStore, and America’s Got Talent. WNBC Programs is in the official Kodi addon repo. 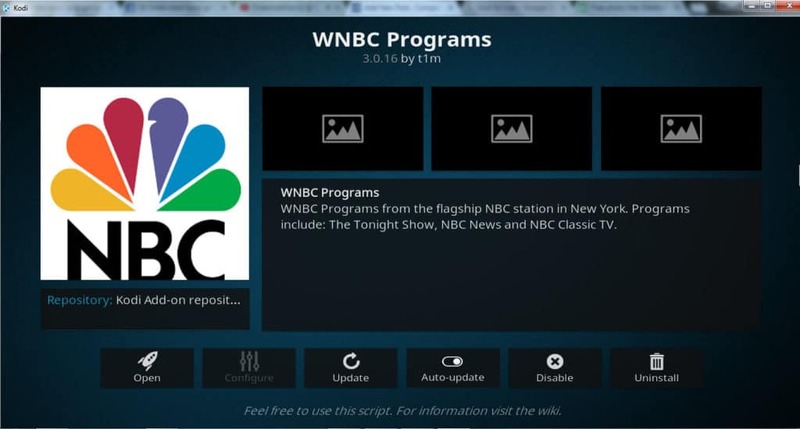 To install, click addons from the main menu, then select download → video addons → WNBC Programs → install. See also: The best VPNs for NBC so you can watch outside the U.S.
Popcornflix is a streaming video site owned by Screen Media Ventures. It has foreign films, documentaries, westerns, and thrillers, including popular movies like Tactical Force, Sleepaway Camp, and The Amityville Terror. It also carries reality TV shows like Prison Families, Chef School, and Ultimate Combat Experience. Popcornflix is in the official Kodi addon repository. Here is how to watch Popcornflix on Kodi. 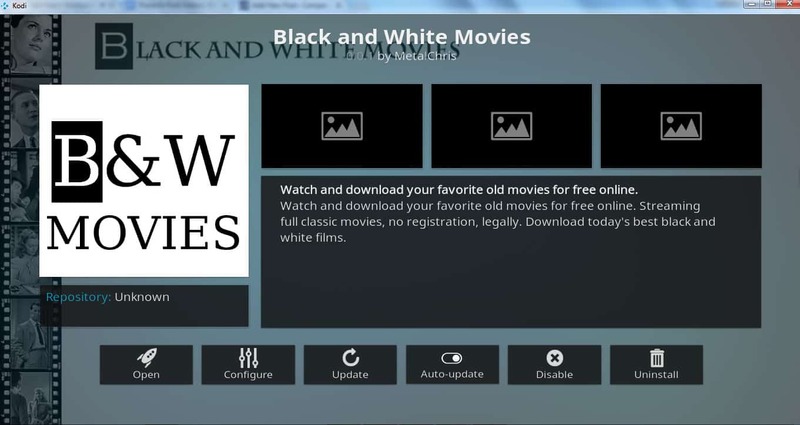 Black and White Movies provides streams of hundreds of classic, public-domain films from the 1920’s-1960’s. It even allows you to download these movies if you want to keep them for offline viewing. Black and White Movies is in the MetalChris repository. The best way to get this repo and the addon is to install them through the Indigo addon installer. From the main menu, select addons → Indigo → addon installer → video addons → B → Black and White Movies → install. If you don’t yet have Indigo, here are instructions for installing and using the Indigo Kodi addon. We hope you’ve found this guide to the Placenta Kodi addon to be helpful. For more info on the best Kodi addons, read some of our other Kodi articles, including the 114 best Kodi addons, how to install the YouTube Kodi addon, and how to watch FilmRise on Kodi, amongst many others.